​​​​​ ALLEN – Texas Health Presbyterian Hospital is planning a $68 million expansion to meet the increasing demand for services throughout Collin County. The 108,000-sf project calls for a three-story patient care tower with 75 medical/surgical beds, perioperative space, two operating suites, and a cardiac catherizati​on lab. 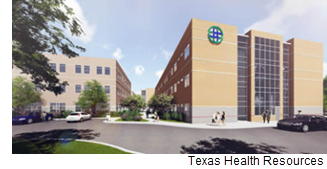 In addition to patient care areas, the hospital will have a pharmacy and laboratory services. Construction will begin in September 2018 and will wrap up in second quarter 2020.